Purify the Air At The Molecular Level With Our O3 Generator & Air Purifier All-in-OnePurify the Air With Our O3 Generator & Air PurifierPurify the Air With Our O3! Removing odors result from fire damage, flooding, mold or similar circumstances can be extremely difficult. In many cases, the only way to eradicate such smells is to destroy the odor at the molecular level. Our unique seven (7) stage air purifier takes this concept one step further by combining activated oxygen technology with six (6) other filtration processes. At the push of a button our PURIFY feature engages an ozone plate to produce EPA-approved safe levels of 03. Trace amounts dissipate throughout the room breaking down airborne particulates at the molecular level. Simply schedule your air cleaner to run while you're away and return to an odor-free home. Once at home, deactivate (or even remove) the ozone plate to enjoy continual HEPA certified air filtration. You will be amazed at just how fresh and clean the air in your home will become. 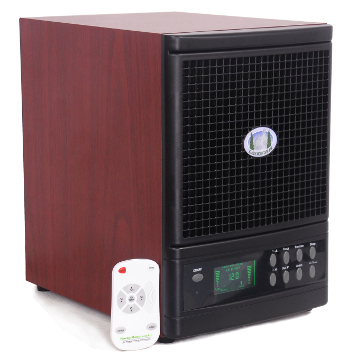 No other air purification method can remove lingering odors and residues like an air purifier with ozone generator. In fact, the 60 day money back guarantee we offer on each of our units demonstrates the faith we have in our products. So, buy the Summit PLUS air purifier today and make the air in your home Rocky Mountain Pure! Seven Stages Of Purification: Activated OxygenUnpleasant odors can be among the toughest elements to remove from the air you breathe. To combat such airborne pollutants, the Summit air purifier utilizes Activated Oxygen (03) to breakdown particulates (such as smoke, household chemicals, and perfumes) at the molecular level. Lingering airborne contaminants oxidize away when coming in contact with the trace amounts of ozone dispersed throughout your home leaving pure oxygen (02) in its place. Such fast acting, deep cleaning power is ideal for smokers looking to bring Rocky Mountain freshness to their home. There is simply no substitute for the Summit. In fact, the Summit's Ozone feature can be safely toggled on and off, giving you the option to use the unit's full cleaning power only when you need it most!